These are two NCLEX review questions for health assessment. These questions provide two scenarios about performing a head-to-assessment on a patient and requires you to use nursing knowledge in how you will proceed with the assessment, along with identifying lymph nodes in the neck. A. Perform light palpation on the abdomen, followed by deep palpation. C. Auscultate for bowel sounds by starting in the right lower quadrant. D. Palpate for bruits and rebound tenderness. To answer this question, you want to think about the sequence in how you assess each system of the body. Based on the scenario, we have already INSPECTED the abdomen. Now, it is time to auscultate it. WHY is this process switched for the abdomen? Because when you palpate and percuss the abdomen you are pushing on the intestines, which contain gastric contents. As you push around on the abdomen, this can alter bowel sounds that may have not presented normally if you didn’t cause them to. Therefore, you want to auscultate before you even touch the abdomen. Auscultating will include listening to bowel sounds and vascular sounds (aorta, renal artery, iliac artery, and femoral artery) for bruits. You’re performing a head-to-toe assessment on a patient. 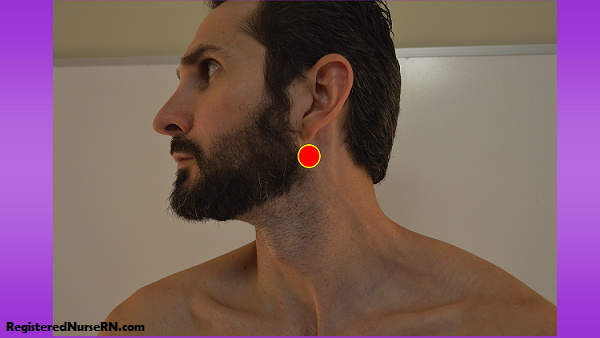 While palpating the lymph nodes of the neck, the patient reports tenderness at the following location. When you document the findings of the head-to-toe assessment, you will note that the patient felt tenderness at which lymph node site? 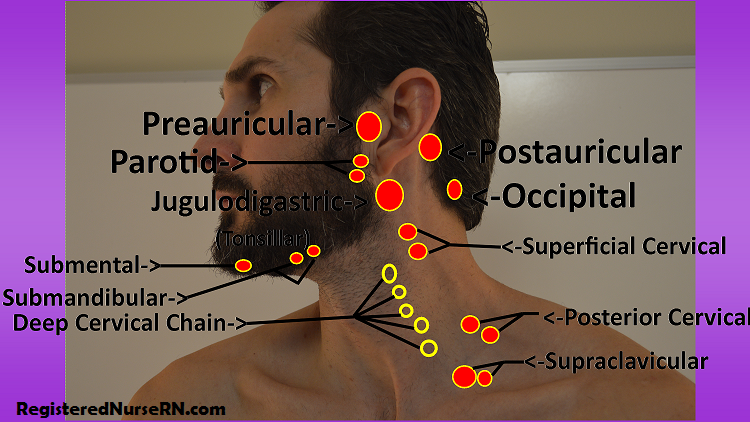 To answer this question, you must think back to your health assessment knowledge regarding the locations and names of each lymph node site in the neck.